Let’s look at some data to see if Santos and Chavez are really onto somehing here. This is the latest of several similar porjects, including the soon-to-come-online widening of the Panama Canal, the Brazilian road through Bolivia that sparked indigenous protests against Evo Morales (Stratfor, 28 Oct 2011), and a Chinese plan for a rail line to ship coal across Colombia that Santos also endorsed in February 2011 (Financial Times, 13 Feb 2011). These all have one thing in common: opening up shorter routes for commodity exports from Latin America’s Atlantic and Caribbean coasts to the Pacific Ocean, then on to Asia and especially China. Frst, whether the new oil boom coming online in Latin America will continue to find a robust market in North America as well as a Chinese market? Second, just how expensive and slow is it to ship ol from LatAm’s Atlantic and Caribbean coasts to China? First, let’s look at the trajectory of US import demand, and, second, the geo-economics of sending supertankers back and forth from LatAm’s Caribbean and Atlantic coasts to China. US SUPPLY AND DEMAND TRENDS: WANING IMPORT DEMAND? So, indeed, a general trend of oil’s share of imports declining all the way back to 2005, albeit with an upward tick predicted for 2012. (We’ll see in a moment that U.S. consmption of oil-and-liquids has been down throughtout these years as well.) It si notable that this decrease has been quite robust wether prices rose of fell: In 2005 prices were taking off, then they crashed in 2008 and then rose again a year or so later. Furthermore, the liquids decline includes refined products (which should be of particular concern to Venezuela as it has always sent a good deal to the U.S.). In fact, it is striking that the December EIA report says refined product imports are actually at their lowest since 1945. Compare two EIA graphs (again Dec 2011) treating the two contributors to this general trend. 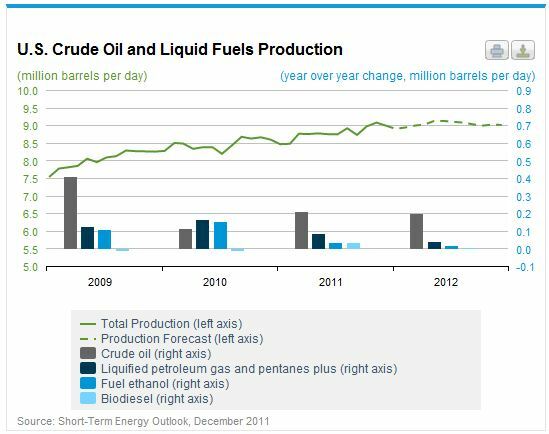 First, US crude oil and liquid fuels production. Notice how domestic production has been increasing. And I dont’ believe anyone thinks there will be less domestic oil from fracking coming online over the next decade (Anecdotally: I recently drove through north-central Pennsylvania and south-central New York State and motels across the regions were full of drilling crews up from central Penna., with nightly rates inflated accordingly). So too, there won’t likely be any drop in US Gulf of Mexico oil coming online in that time. 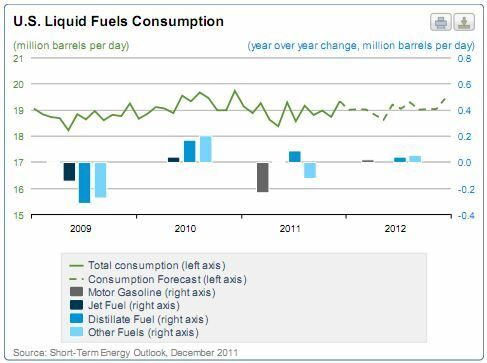 At the same time, consider that the EIA data shows U.S. liquid fuels consumption, shown next, at roughly 19 mbd for the entire time shown. In years past, this had been up around 21 mbd. So, while Latin America has many new oil projects coming online, U.S. import demand is waning. This means LatAm access to Asian markets will acquire increasing importance (perhaps delayed by a global return to recession in 2012 and a general drop in oil prices, but, that’s another matter). In principle (that is, to first-order) the world oil market is just one “Global Barrel” (as this blog is titled!). And, new recessions aside, clearly world demand is projected to continue rising over the long term. 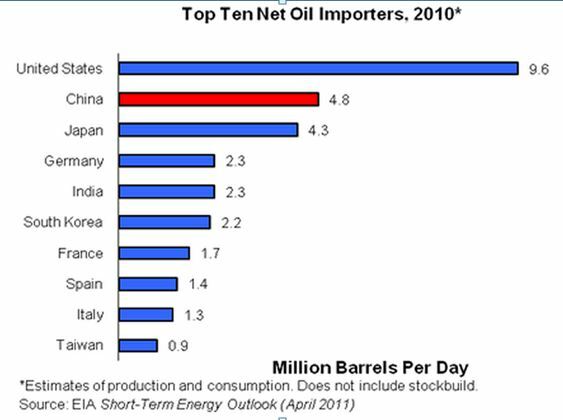 So, all the oil coming online in Latin America can just be shipped to China, India and etc., no? Yes, of course it can. However, look at a map, and you’ll quickly see why the profitability of this is significantly less than selling to the U.S. or, for that matter, Europe. With almost all the new oil on the Atlantic side of the continent, and supertankers still unable to transit the Panama Canal, it is a really long haul to reach China. But, what if Santos’ and Chavez’ pipeline gets built? I’m no expert on sea-transit times. So, I’ve resorted to the “Sea Distance Calculator” at http://sea-distances.com/ and the results are a bit of a surprise. Second, down south and east across the Atlantic through the Cape of Good Hope below Africa and then up across the Indian Ocean, into the Pacific to Shanghai. 54.9 days at sea via the Cape of Good Hope. But, what if oil got to the Pacific Coast of Colombia, using the Santos-Chavez pipeline to the port of Tumaco just north of the Ecuadorian border? The calculator gives just 35.8 days at sea. 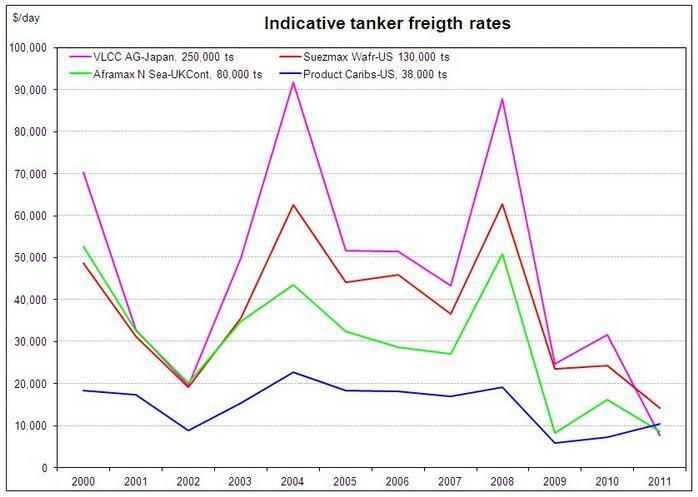 Note, the price per day of transport in large (here, VLCC) tankers has fallen considerably since 2008. However, over the past decade the price has ranged between $10,000 to $90,000 per day. Further, one must remember that the tankers have to go both ways—ida y vuelta–returning empty to pick up another load of oil. So, let’s look at the number of round trips a given tanker could make from Venezuela to China with and without this pipeline. 365/(55 x 2) = 3.3 trips/year. 365/(36 x 2) = 5.1 trips/year. Not bad. Of course, in this comparison, the cost of transport via the proposed Venezuelan-Faja to Colombian-Pacific-Coast pipeline is not zero; although pipelines cost less per unit distance than tanker transport. So, at (4.8 x 10^6) bbls/day in Chinese imports, this means each tanker could supply about 2.1 days of Chinese imports per year. The veneer of ideological motivation which President Chavez has constantly given to oil trade with China in a “special relationship” while, right to the north and close by is the till-now seemingly insatiable US market, has done much to undermine the credibility of any actual market logic for China-centric oil projects (Please remember, I’m not saying that the US won’t continue to be an important customer, that’s not the point, just that it likely cannot absorb the new LatAm oil boom). Today’s Bolivarian PDVSA is still struggling at home to reverse a decade of declining oil production, and has left the rest of Latin America littered with abandoned or stalled energy projects President Chavez promised PDVSA would carry out. 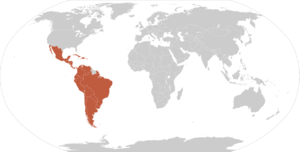 The laudable cause of “Latin American energy integration” and of improved energy supplies and infrastructure generally has been left to suffer in Ecuador, Bolivia, Brazil, Argentina, Trinidad & Tobago and etc. with little to show for a decade of their collaborations with PDVSA. However, this pipeline, and any similar projects that would facilitate oil shipments to Chinese and Asian markets have their own, rather sound material-economic logic. Santos’ statement of this pipeline’s importance is not hype; but the likelihood of its completion anytime soon, and of there being sufficient oil produced in the Faja to fill the pipeline any time soon will remain very low until PDVSA’s managerial and technical capabilities are significantly improved and/or it is joined by a major ally with the appropriate technology, capital and managerial capabilities. In this regard, one can easily imagine this proposed pipeline having a spur originating somewhere in the Gulf of Venezuela, north of Maracaibo, for tankers from Brazil’s pre-salt and the entire Caribbean region to come and pump their cargoes into the new pipeline, joining with future oil from the Faja. In fact, Petrobras would be ready for this pipeline well before PDVSA and the Faja are ready. This entry was posted in Chavez, China, Economic Crisis, Energy and Environment, Faja of the Orinoco, heavy oil, Hugo Chávez, international relations, PDVSA, Resource conflicts, U.S. oil, Uncategorized, Venezuela diplomacy and tagged China, Colombia, Evo Morales, Latin America, Pacific Ocean, Panama Canal, pipeline, Santos-Chavez, United States. Bookmark the permalink. Another neat post with lots of conventional-wisdom debunking. Thanks. Re the punchline: Indeed! Re: future eggs being counted, yes. However, a reason to go into these things now, in some detail, is that I think there is insufficient discussion in opposition circles as to what will be the _future_ constrains on and trajectory of the Venez. oil sector. And, for the _present_, most of the opposition underestimates that some increased production can be accomplished now. If they believe they are going to be running the biggest oil sector in LatAm soon, I’d hope by now there would be more analysis and lively debate coming out, beyond focusing on critique of the present government. There is some, but I’d expect much more.